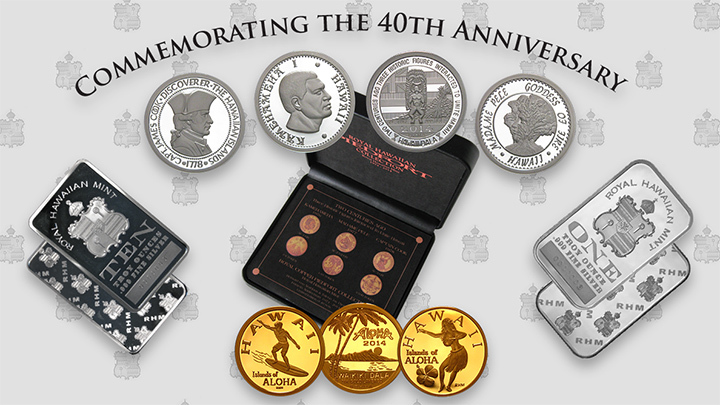 Current Issues for 2014 commemorate the Mint’s original three designs with the Founders Series with: Kamehameha the Great, first king of Hawaii; Madame Pele, the volcano Goddess of Fire and Captain James Cook, the enlightened British captain who discovered Hawaii. Working from the original Mint artwork and inspired by the original hand cut dies from 1976, 1977 and 1978 new stunning hand sculpted ten inch portrait masters provide amazing 3D detail that was created by super medallic artist Luigi Badia. The three historic Founders figures are incorporated with a common reverse with the British flag, Tiki God and a Hawaii volcano that ties the three historic figures together. The two 2014 Waikiki Dalas, commemorates surfing – Hawaii’s gift to the world and the hula – the dance of the islands. In celebration of Royal Hawaiian Mint's 40th anniversary, the first 100 customers ordering a qualifying 2014 edition will receive a 25th anniversary coin for free! For more information, see our 40th Anniversary Special Offer. What is your favorite royal issue? © 2015 Royal Hawaiian Mint. All Rights Reserved.